KAMPALA/ MBALE – Whenever Yusuf Walimbwa, 14, from Bukyabo in Sironko district gets seizures during school or at home and collapses, his friends/ other students run away, leaving him helpless. At this time of the episode, he usually drools and his head and arms jerk uncontrollably throughout. He says his peers explain to him that they can’t help him when he is having an epileptic attack because they fear that if they came into contact with his saliva, then they would also easily contract the disease. At home his grandmother kept him in a separate room, because she believes that breathing in the same air with such a person after puffing, would also make them get epilepsy. His grandmother says Walimbwa is tormented by evil spirits of his late father and grandfather “Actually he could have been bewitched by the co-wife to his late father,” the Old woman adds. Walimbwa has suffered a lot of discrimination over a condition he has no control over, because he was born epileptic. Walimbwa is not alone, there are many people living with Eplepsis who are going through what Walimbwa is facing at home, at school and in the community just because people don’t understand what Eplepsis is and how one can catch Eplepsis. According to Dr Muhammad Mulongo, the district Health Officer for Bulambuli, Epilepsy which means a tendency to have recurrent seizures occurs when there is abnormal electrical discharge in the brain. Dr Mulongo adds that it is caused as a result of brain damage brought on by injury, infection such as Encephalitis or meningitis, hormonal problems and tumours. “Anyone can develop epilepsy at any time, any age and though some people are born with epilepsy, others get it later in life what government needs to ensure is constant delivery of epilepsy vaccines to health centres to enable people in different parts of the country access these drugs for prevention,” explained Dr Mulongo. Dr Richard Idro, a consultant paediatrician and paediatric neurologist at Mulago Hospital, defines epilepsy as a neurological disorder of the brain in which an affected person has a tendency to get unprovoked recurrent seizures or fits. Seizures are brief episodes of involuntary movement that may involve one part of the brain (partial seizure) or all areas of the brain (generalized seizure). “Seizure episodes are a result of excessive electrical discharges in a group of brain cells. The discharges may remain confined in that part of the brain that is affected by the seizure and will manifest as jerking movements, or abnormal sensations in the body, where by a person feels like things are moving into his/her body in the part controlled by the affected area of the brain,” Dr Idro said while appearing on the NBS TV February 3. He explained that if the seizure attack involves the entire brain, it may manifest as convulsions that shake the whole body and with loss of consciousness. He noted that a seizure attack happens suddenly, lasts a short time and stops on its own and that therefore a patient cannot do anything to stop it from occurring. 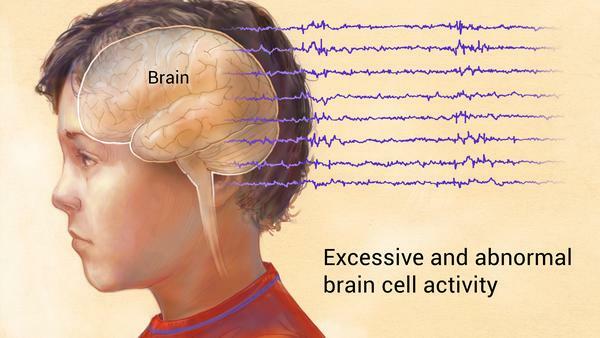 The frequency of seizures varies, for some individuals, it may happen more than five times a day, while in others; it may happen once a month or year. Dr Idro said a one-off seizure episode does not signify that one has epilepsy and that up to 10% of people worldwide have one seizure during their lifetime. Dr Idro reveals that there are several causes of epilepsy and that in Uganda, among children, the condition is largely due to infections during pregnancy, delivery and after child birth- these account for 5% of the cases of epilepsy in Uganda. He added that 95% of cases of epilepsy among children have no identifiable cause. He explained further that Epilepsy among children can be due to brain damage from prenatal injuries such as damage to the embryo or foetus before birth, low levels of oxygen reaching the child’s brain, injury to brain cells from toxins, bleeding in the brain and low birth weight. Dr Abdu Kisekka, also a neurologist at Mulago said care including proper nutrition for the mother, detection of high risk pregnancies and managing of high blood pressure and infectious diseases during pregnancy can prevent brain damage in the developing baby that may lead to epilepsy. He said pregnant women must also avoid consuming alcohol, smoking and self-medication as these habits are known to increase the risk of exposing an unborn baby to infections that can cause epilepsy. He explained that eating undercooked pork is another new worrying cause of epilepsy that is on the rise worldwide. He explains that brains are infected by the tapeworm known as Taenia Solium (taeniasis) acquired by humans through the ingestion of tapeworm larval cysts in undercooked pork or beef. He revealed that the other causes of epilepsy in other age groups include; stroke, or brain tumours, head trauma and fracturing of the skull sustained in road traffic accidents, cerebral malaria and meningitis. “Pork must be well-cooked to kill all the eggs and avoid catching trichinosis, a food-borne infection that is typically acquired by eating under cooked pork,” added Dr Kisekka. According to Centres for Disease Control and Prevention, eating raw or undercooked pork infected with the parasitic worms, Trichinella spiralis can lead to trichinosis. When cooking pork, it essential that the meat is handled and stored properly to ensure safety, a clean working environment is essential in the prevention of contamination when working with pork. Dr Idro said there are different types of epilepsy categorized according to the cause. -The symptomatic or secondary type of epilepsy is caused by trauma, brain infections during childhood, stroke or tumours. -The cryptogenic type of epilepsy is epilepsy with no obvious cause, and several researches are being done to find out what causes this type of epilepsy. -Dr Idro says idiopathic type of epilepsy is the most common type of epilepsy which affects six out of ten people with the disorder worldwide. Dr Mulongo says symptoms of a seizure include jerking and drooling of saliva, severe headaches, unusual heart pounding, abnormal sensation in a way that a patient feels like caterpillars are moving all over their bodies. Other symptoms are loss of consciousness followed by confusion, falling, clenching of the teeth, biting the tongue, having sudden, rapid eye movements and having uncontrolled muscle spasms. Dr Idro explains that sometimes, seizures are triggered by missing medication, heavy alcohol use, cocaine or drug use, stress, sleep deprivation, and flickering lights. “An epileptic patient ought to religiously take medicine and stay away from things that may trigger an attack, such as staying away from alcohol or drug abuse as well as staying calm all the time. Stress, anger and depression can trigger a seizure,” Dr Mulongo says. According to a study done at the same facility in 2010 and published in the Neurology journal, young people aged between 20 and 29 years, adults aged between 45-50 years were more affected with the disorder than other age groups. The study also revealed males were more affected by epilepsy than females, and this was attributed to exposure to recreational drugs, high levels of alcohol intake, high levels of stress related to work, academics, and traffic accidents among others. Dr Idro says epilepsy is quite common in Uganda, out of the 44 million people, about 400,000 Ugandans have the disorder, that is 1/100 Ugandans has the disorder. He adds that some surveys were done in regions like Northern and Rwenzori’s, and central and that the prevalence is quite higher at 2%. According to the executive director Epilepsy support association Uganda, Augustus Mugarura, the diseases has been fuelled by poor access to medical care and lack of awareness about epilepsy. He explained that a total of 1 million (about 3.3%) Ugandans are suffering from Epilepsy with limited access to epilepsy medication. “Many people have neglected the disease which is common among children, parents don’t care about seeking treatment for their children that have acquired epilepsy they think it can cure on its own or they simply don’t understand the disease,” said Dr Mugarura. According to WHO, about 50 million people currently live with epilepsy worldwide, globally, it is estimated that 2.4 million people are diagnosed with epilepsy each year. In high-income countries, annual new cases are between 30 and 50 per 100 000 people in the general population while in low- and middle-income countries, this figure can be up to two times higher. According to the Epilepsy in the WHO African Region, the Global campaign against epilepsy, bridging the gap on the African continent suggests that epilepsy affects 10,000,000 people directly, and these are people of all ages most especially within childhood, adolescence and aging population. Close to 80% of people with epilepsy live in low- and middle-income countries. According to Dr Idro, Epilepsy comes with emotional, psychological and social-economic effects not only to the patient but family members. He added that People living with epilepsy can be targets of prejudice, the stigma of the disorder can discourage people from seeking treatment for symptoms, so as to avoid becoming identified with the disorder. Dr Idro revealed that in many African cultures, epilepsy is associated with ancestral and traditional rituals, evil spirits or witchcraft, and many times, the patients are abandoned by their relatives. He said in Uganda alone, 90% Ugandans believe epilepsy is as a result of evil spirit, and when a person develops the condition, he or she is rushed to witch doctors or traditional herbalists, it is when the patient fails to improve that the relatives decide to seek for medical care. Other myths associated with epilepsy include; one can swallow their tongue during a seizure, something like a stick, fork or spoon should be forced into the mouth of someone having a seizure so that they do not bite themselves. Experts say this is absolutely wrong; as such objects may harm someone’s teeth, puncture the gums or even break someone’s jaw. “Don’t put anything in the mouth of the person who is undergoing a seizure because it can damage his jaw forever,” Dr Idro advised. Dr Idro says epilepsy is a treatable disorder, and with adherence to medication, epileptic people can live normal and productive lives. He explains that a number of drugs are taken to control epilepsy and that up to 70% of patients receiving appropriate anti-epileptic drugs and taking them as prescribed by health workers will get cured; the 20% can only have the number of convulsions reduced with the help of the medication, while the 10% may not recover at all because they have severe forms of epilepsy. He revealed that anti-epileptic drugs are available in most health centre III, IVs and all general hospitals in the country, though sometimes there are shortages. But despite the availability of the drugs, 60-80% of patients do not take these drugs, the convulsions remain uncontrolled and patients suffer repeated seizures. Dr. Idro explained that a person living with Epilepsis should be able to talk to social workers who work with health facilities for social support to avoid challenges of discrimination from community. Dr Mulongo explained that medication plays a crucial role in treating and managing the condition, but warns that patients, who live in denial, do not want to accept they are sick and seek for medical assistance, may live uncomfortable lives of constant attacks. He called upon caretakers or relatives of people living with epilepsy to be supportive because this will encourage them to come out and seek for help other than living in denial.